Manchester has many 'forgotten' underground spaces - canal tunnels, mines, caverns and mysterious route stretching beyond the city. This book provides details of a 'lost' river, a water wheel, about the secretive 'Guardian' bunker and of walks beneath the city's famous streets. "There are always urban legends but in this case Keith Warrender has collected all the available evidence, so far, to guide us and has been given access to the official records to substantiate the facts, where appropriate. Clearly there are large elements with an excess of information that has had to be condensed so we don't loose interest and there are lots of tantalising gems that deserve to be investigated further providing it is safe to do so. I have joined guides in other Cities and would like to see an underground tour in Manchester - perhaps starting from the Cathedral Arches. Hopefully there will be a second volume and the twin Cities of Salford and Manchester can be brought closer. The presentation of the major elements is clear and the scrapbook of tantalising glimses for other items begs for more. Local explorers can start in Castlefield, visit the Science Museum Exhibits for Water and Sewerage then follow the Rochdale Canal around GMex. 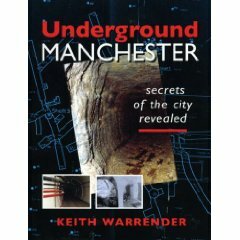 Those of us that recall the Subway under Deansgate between the Kendals buildings will find a few answers here. Review by J A Kidd"